On Thursday night, Class 3A and the two Eight-Man divisions took center stage to close out their regular season. These three classifications will open the playoffs on Tuesday night. The War on 24 between Silver Lake and Rossville is one of most anticipated game each year. This season was no different as the No. 1 Eagles and No. 2 Bulldogs battled on Thursday night for a district championship in Rossville. Rossville scored three touchdowns in the second half en route to a 24-14 win over their arch rivals. For a second consecutive season, the Bulldogs topped the Eagles to win the Mid-East League title. Defense ruled the night early as Rossville managed only a Paul Steinke 19-yard field goal just before half to take a 3-0 lead. The Bulldogs came out in the second half and scored on a a 29-yard pass from Tucker Horak to Nick Reesor to take a 10-0 lead. Horak would add a 15-yard touchdown run to make it 17-0 early in the fourth quarter. Silver Lake would finally get on the board a little more than a minute later as Zach Boyd scored to cut it to 17-7. Horak put the game away with a 24-yard touchdown run and a 24-7 lead. Horak finished with nearly two-thirds of Rossville’s 300 yards rushing on the night. The Week 9 vote for Kpreps Fan’s Choice for Game of the Week was so close this week, we decided to feature both of the top games receiving votes. One featured an Eight-Man showdown between No. 1 Hanover and No. 4 Osborne. After a back-and-fourth first half, Hanover shutout the Bulldogs in the second half and pulled away for a 54-26 win. Hanover grabbed an early touchdown lead , but Osborne tied the game at 20 on a 71-yard touchdown pass from Jake Tiernan to Brandt Wolters. Osborne tacked on another touchdown before half to take their first lead at 26-20. Hanover responded with a late touchdown pass and two-point conversion to lead 28-26 at halftime. The second half was all Wildcats as Hanover scored, got a turnover and scored again to go up 40-26. That’s the way the third quarter ended, and the Wildcats tacked on a pair of course in the final quarter for the win. The other game garnering the Game of the Week designation by the Kpreps’ fans was unbeaten Hesston at Southeast of Saline. After falling behind early, Hesston used a big night from quarterback Grant Raleigh to claim a 35-13 victory and the District 12 title. Raleigh tossed touchdown passes to Zach Esau and Scott Duerksen in the first half to lead 14-6. The senior signal-caller then rushed for a pair of scores , including a 6-yard run with 8:12 remaining in the game to push the Swathers to a 28-13 lead. Hesston is 9-0 and will host Hutchinson Trinity in the first round, while Southeast of Saline will travel to surprising Halstead. 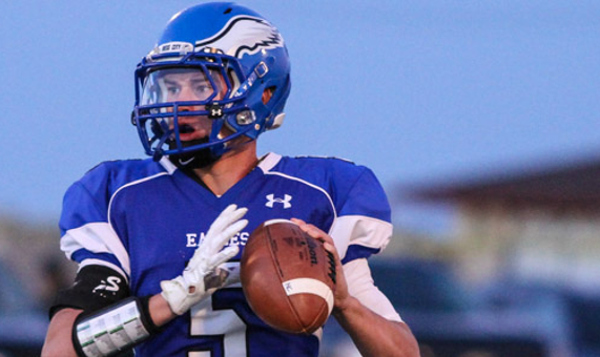 The Halstead Dragons scored with less than a minute to go to hand Hutchinson Trinity its first loss, 24-21. The game started off with Blake Beckett returning the opening kickoff 96 yards for a touchdown and an 8-0 Halstead lead. The Celtics returned the favor right back as David Thibault scored from 78 yards on the ensuing kickoff. Thaibault added a 32-yard scoring run before halftime to give Trinity a 14-8 lead. The Celtics expanded tha lead to 21-8 in the third quarter before Beckett cut it to 21-16. Halsted mounted a final drive that resulted in Beckett’s third touchdown of the night; this one from 7 yards out to give the Dragons a 24-21 lead with 38 seconds remaining. Trinity would respond by getting the ball inside the Halstead 20-yard line with 5 seconds remaining, but the Celtics field goal attempt on the final play was blocked. While it was the smaller classes the primarily took center stage on Thursday night, there were a handful of 6A and 5A match-ups sprinkled in the schedule. In Class 6A, No. 3 Blue Valley survived a scare from EKL-rival Blue Valley Northwest before winning 20-12. Northwest led 6-0 for most of the game before the Tigers got on the board with under a minute to go in the third quarter to tie the game at 6. The Huskies would regain the lead on a touchdown pass from Zack Zegunis to Jake Loftness to make it 12-6. The Tigers would respond with a Will Evans touchdown run with under five minutes remaining and convert the PAT for a 13-12 lead. Blue Valley would add another score from quarterback Colton McCumber to win the game 20-12 and the District title. Elsewhere, Kapaun Mount Carmel secured a playoff spot in Class 5A with a 17-14 win over No. 4 Wichita Heights. The Crusaders led 10-7 at halftime before Tre King scored in the third quarter to put Heights ahead 14-10. Kapaun quarterback Brock Monty scored on a 6-yard run with around 7 minutes remaining to give the Crusaders all they would need. Monty rushed for 80 yards and both Crusader touchdowns. The Kapaun win ensure both the Crusaders and Heights would advance out of District 5, but in what order is still to be determined. Should Emporia beat Andover on Friday night, Kapaun is the district champion by virtue of their head-to-head win over Heights on Thursday. Should Andover win, they will finish in a first place tie with the Falcons and Crusaders at 2-1 in the district standings. The district point tie-breaker system will be used to determine the top two teams, and they would finish with Heights as the champion and Kapaun as the runner-up. Another fourth-ranked team fell on Thursday, but this time in Class 3A as Chaparral knocked off Conway Springs, 27-19. Chaparral scored on its first two possessions to take a 14-0 lead before the Cardinals answered with a pair of touchdown runs to pull within 14-13. Chaparral quarterback Shawn Nulik hit Roger Clark on a 77-yard touchdown pass before halftime to take a 21-13 lead at the break. Conway pulled within 21-19 in the third quarter on a Ben Pauly touchdown run. But Nulik had another answer in the form of an 8-yard run of his own to push the lead to 27-19 where it stayed. Nulik rushed for more than 100 yards on the night and passed for nearly 200. The Roadrunners now will host Leon-Bluestem on Tuesday to open the playoffs, while Conway Springs has to travel to Wichita Collegiate. In 8-Man, Division I, Hodgeman County traveled to Ness City with the winner advancing to the playoffs and the loser staying home. In a back-and-forth game that saw four ties and four lead changes, Ness City held off the Longhorns 50-48 in overtime to reach the playoffs out of District 7. The Eagles and Longhorns were tied at 34 late in the fourth quarter when a Ness City turnover led to a Hodgeman County touchdown and a 42-34 Longhorn lead. The Eagles would answer to tie the game with 7 seconds remaining and force overtime, tied at 42. Ness City would score first on their first possession on a Tanner McMillen touchdown. The two-point conversion gave the Eagles a 50-42 lead. Hodgeman County would fumble on their possession, but recover it in the end zone for a touchdown. The Longhorns two-point conversion attempt was no good giving Ness City the win and the playoff spot. There was another wild finish in 8-Man, Division II. Beloit St. John’s-Tipton needed to simply win over Northern Valley and the Blujays were in the playoffs. If they lost, it would create a three-way tie for the district runner-up spot and Thunder Ridge would sneak into the playoffs with the highest point total in the district tie-breaker formula. Despite some key injuries, St. John’s-Tipton appeared to be cruising early as the Blujays built a 38-8 halftime lead. Northern Valley began to chip away. The Huskies pulled to within 38-24 at the end of the third quarter, and within 38-30 with just over three minutes remaining. The Huskies then completed the 30-point comeback to tie the game at 38-38 with 18 seconds remaining. But St. John’s-Tipton had one last answer in the form of a Trey Dubbert 65-yard Hail Mary touchdown pass to his brother Davis Dubbert on the final play to propel the Bluejays to a 46-38 win and a playoff spot in Division II. Maur Hill-Mount Academy won the District 3 championship with a 26-13 win over McLouth on Thursday night. The Raves qualify for the playoffs for reportedly the first time since 2004. Maur Hill-Mount Academy will host Silver Lake in the first round on Tuesday. Finally, we have to mention the performance by Fairfield’s Cannon Burns on Thursday night. The senior rushed 31 times for 565 yards and 11 touchdowns in a 91-44 win over Bucklin. Burns reportedly finishes the season with 2,914 rushing yards and 43 touchdowns. The 2,914 rushing yards in a season would be a new state record; breaking that of 2,841 by Bryan Kendall of Haviland in 1974. Burns’ 11 touchdowns in a game would also tie the 8-man record set by Jake Kizzar of Chase in 2009.